Thank you for your warm words about my book in Hebrew Why Do They Hate Us?. 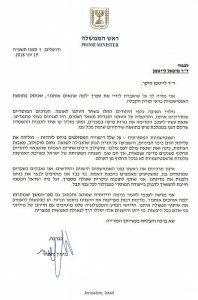 Further to your letter, it is my hope that the people of Israel will become familiar with the beauty and depth of the wisdom of Kabbalah and will use it to help reach a brighter future. With regard to writing a sequel entitled Why Do They Hate Us?, I promise that it will be written, but to justify this, it is important that we focus on the fulfillment of our role to set an example and be “a light unto nations,” for all nations of the world. You may download the book in Hebrew or the booklet in English with a similar message: “Who Are You People of Israel?”. I thank you for sending me a copy of your book Why Do They Hate Us?, which deals with the phenomenon of anti-Semitism from the perspective of Kabbalah. Traditional anti-Semitism—with its many distorted images of Judaism—gave rise to blood libels in the Middle Ages and influenced the racial theory that led to the Holocaust. Nahum Sokolov, one of the founders of Zionism, called it “world hatred for the people of the world.” Sokolov and many others believed that hatred of Jews would pass when we establish an independent state, but they were wrong. Israel’s distorted presentation as the enemy of humanity shows that anti-Semitism will not disappear from the world easily. We do not lower our heads before the anti-Semites, old or new. We fight the lies about us, and invest efforts in disseminating the truth. At the same time we continue to fortify our strength and build our state. I agree with the main insight that stems from your book, according to which the small state of Israel must continue to adhere to its moral destiny as a beacon of light to all nations of the world. And allow me to offer a friendly suggestion, that you should write a follow-up book entitled Why Do They Love Us?. Many countries admire our achievements in matter and spirit. They seek to deepen their collaboration with us. Our innovations in science and technology benefit the lives of millions of people on all continents. May these achievements pave the way for the redemption of humanity from its misery. Best of luck and much success in your fruitful endeavours. Question: How can degrees of different qualities be multiplied with each other: five degrees of the individual soul and five degrees of the spiritual worlds? Answer: They do not multiply; rather, they mutually enter into each other. Each of the degrees has 10 parts, and each of them also has 10 parts, and so on indefinitely. Five Sefirot form one Partzuf, five Partzufim form one world and there are five worlds in total. So we get: five Sefirot times five Partzufim and times five worlds—125 basic degrees. However, when we go through them, we also include many other sub-degrees that are formed within us. Yet, we do not take them into account because they accompany our actions. We cannot take into account billions of various small desires that exist in us on the inanimate, vegetative, and animate levels and the smallest nuances in our relationships with each other. We are in an integral system and when a person makes even one small movement, he affects the entire system. You pulled something, like a spider pulls a strand and the entire web is immediately activated. It is the same here. Where Is The Creator Revealed? Question: Where is the Creator revealed? Answer: I reveal everything within myself, within my desire. The same holds true with the Creator. Just like I feel the world where all my senses engage to perceive reality, I also feel the Creator. At first, I feel that He is behind reality, controlling at least its individual parts. For example, I have a court date coming up. Therefore, I grasp that the Creator is behind all my enemies, controlling them in order for me to understand that it comes from Him and that there is none one else besides Him. This is the first step. The second step is when all His “representatives,” usually quite unpleasant, turn into angels whom I love because with their help I reach a connection with the Creator. There is no other way that I can reach this adhesion with Him. It is impossible to reach connection with Him in a pleasant way because I am pure evil, opposite to Him. Therefore, I give thanks for the bad as for the good and come to love them, feeling no hatred for them. However, there is still a consideration of the corporeal world. According to it, I have to fulfill this work the way it is required by the laws of our world: go to court, get fines, and deal with them. In fact, I thank the Creator for sending such messengers to me. He chose them, which means that this is exactly what I need in order to advance. Question: Why are actions required in this world? Answer: Every spiritual root has to eventually reach its material branch. After we short-circuit all the spiritual roots with their material branches, this world will disappear from our senses. Question: What if a person neglects solving problems in this world? Answer: If you neglect acting in this world, then all these problems will keep coming back to you in different ways until you start treating them correctly.